Object design is headline news, these days. Every time Apple reveals the next model of its iPhone, the internet lights up with the opinions of ardent fans and the inevitable naysayers. 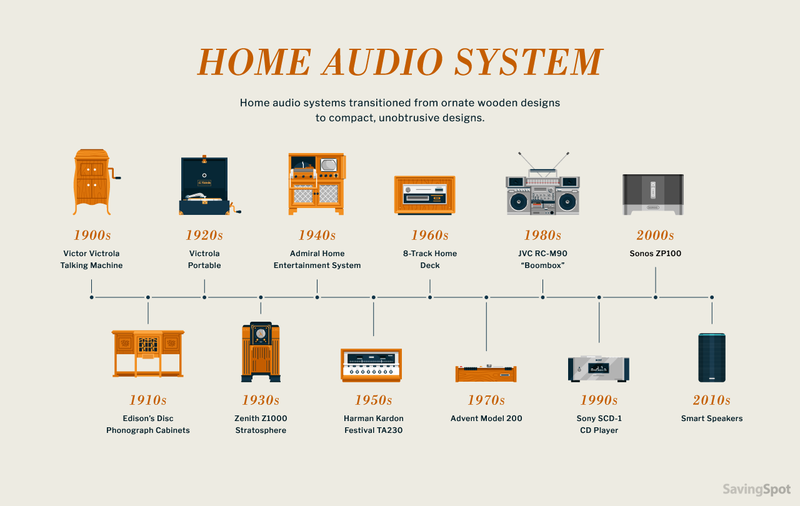 But behind the nitty-gritty of the latest upgrade is the story of decades of evolution. 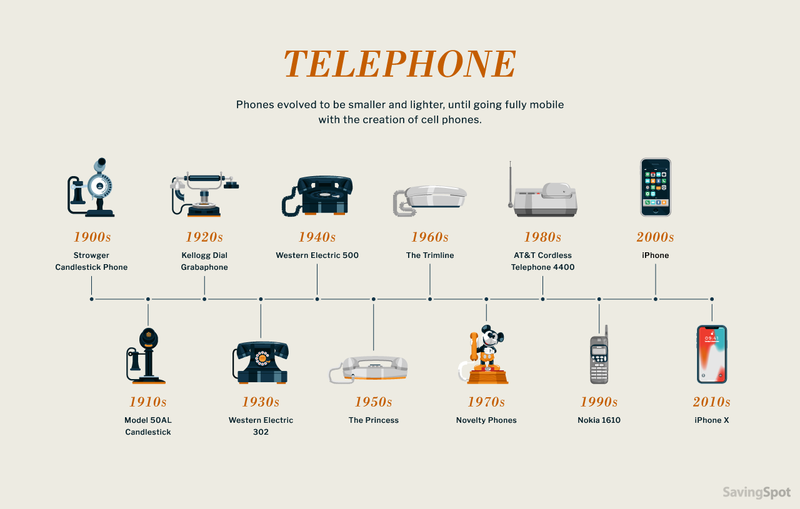 Today’s devices look nothing like the most common telephones of one hundred years ago. And it’s not just phones. 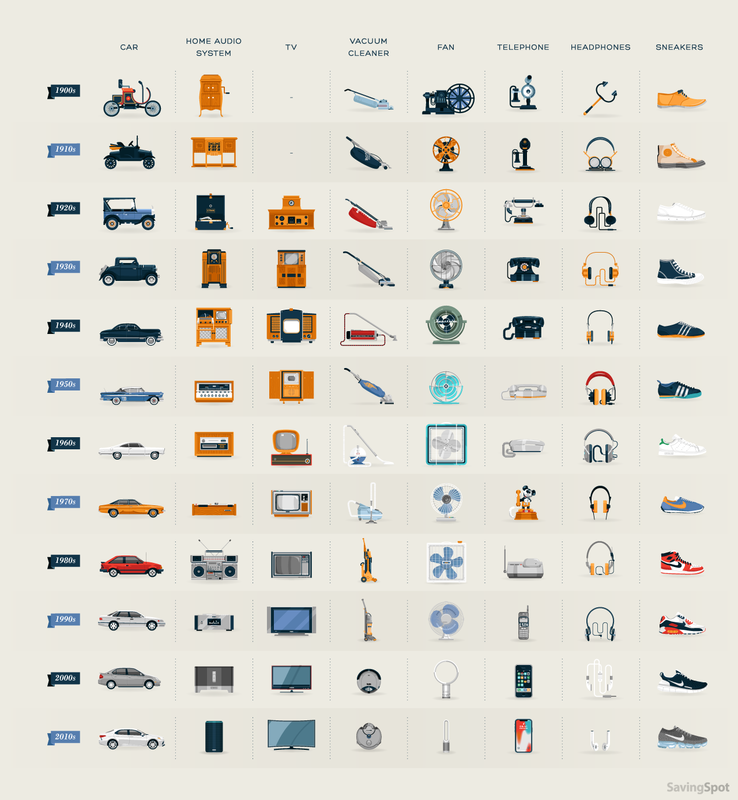 From sneakers to vacuum cleaners, there’s a rich lineage of innovation and design genius. After the industrial revolution, object design would never be the same again. The combustion engine and the taming of electricity enabled inventors to scale up production. And the materials now possible (such as steam-bended wood and plastic) gave designers the chance to change the way our lives look. 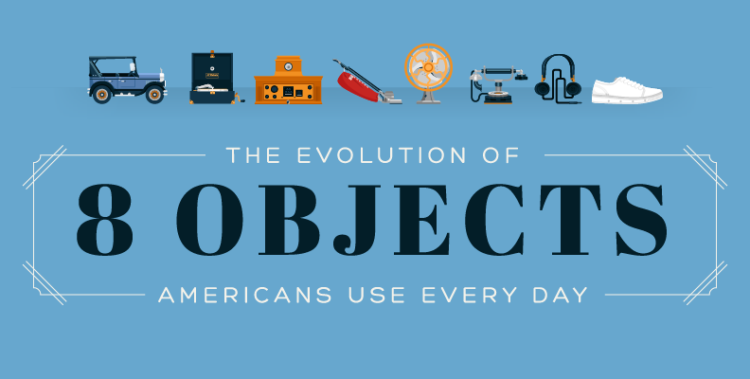 Inspired by the changes you see around you, we decided to create a chart to show just how much the objects Americans use every day have evolved since the start of the 20th century. We looked at Raymond Loewy’s 1934 chart, which did the same for mainstays such as the chair and the drinking glass, and also included then-recent inventions such as the car and the telephone. The poster itself is a classic of design! Our chart picks up the story in 1900. And you’ll be amazed what’s changed. You might not expect Henry Ford’s first car designs to include electric windows, but no windows or doors at all? Ford had just the horse and cart for inspiration, and it wouldn’t be until the 1920s that ‘closed’ cars came into fashion. The 1950s was a boom time for the American automobile. While Europeans scaled down, stateside cars grew to reflect the burgeoning wealth of the American middle-classes. Just check that racy Chevy Impala! This sort of car didn’t stay on the road long, but it sure made an impact. It’s a far cry from the Victor Victrola Talking Machine of the 1900s, when ‘His Masters Voice’ referred to the novelty of hearing recorded voices on a disc made of shellac. From the 1920s on, Americans began to experience the world through their television set. Mass communication like this began to change the world. 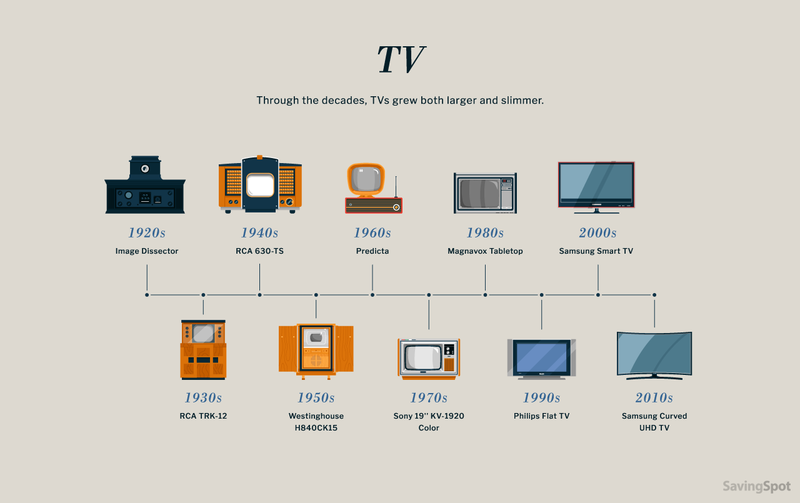 Meanwhile, the remarkable evolution of the actual television set went relatively unnoticed. The first TV sets were designed as furniture, reflecting both their size and the part they would come to play in everyday American life. Smaller, portable sets and consoles made TVs more convenient in the 70s and 80s. But in recent decades, TV designers have scaled things up again: plasma, LCD and OLED technology has enabled them to create bigger, lightweight sets for a more cinematic experience. 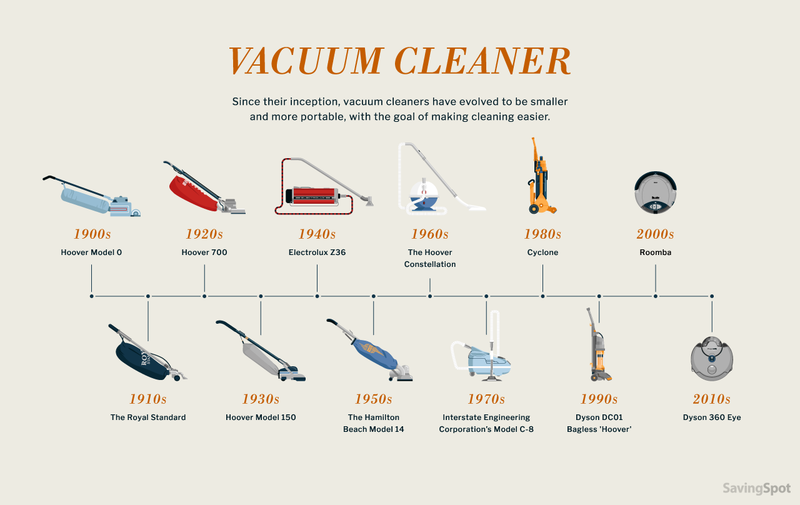 Can you imagine a world before the first motorized vacuum cleaner, in 1901? Ives McGaffey did. In 1869, he created the very modern sounding Whirlwind, which was operated with a hand-pump! Imagine what he would make of the mighty Roomba robot today. But there is one name that can’t be ignored in the world of the vacuum: James Dyson. He built over 5,000 prototypes in the fifteen years leading up to his unveiling of the bagless Dual Cyclone Machine. 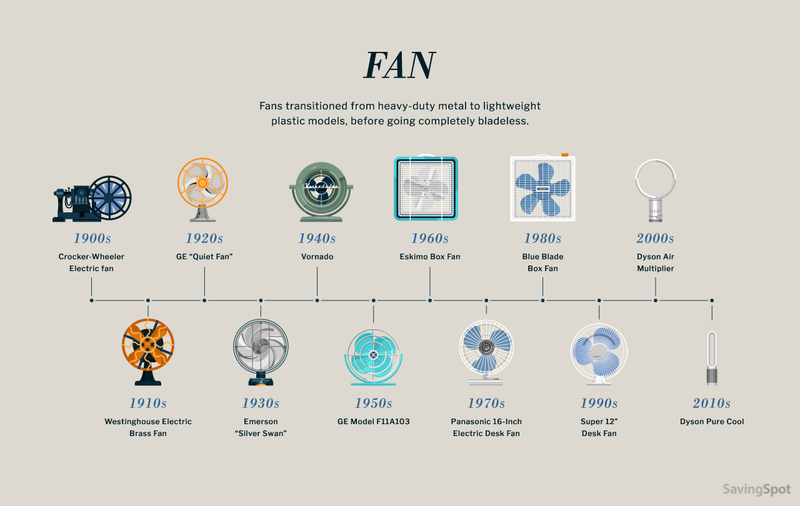 The first mechanical fan was invented nearly two millennia ago, during the Han dynasty in China. It took just one man to cool an entire hall by operating a rotary system composed of seven 10-foot wheels. 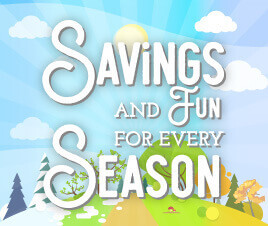 But it was not until boy genius Schuyler Skaats Wheeler motorized two rotating blades in 1882 that we would have the first self-propelling fan. What a cool guy! But in the 2000’s it was Dyson who again entered the fold to revolutionize the domestic fan, with a bladeless – bladeless! – design. The Dyson Multiplier sucked air through the bottom and blew out it cooler, while the Pure Cool now filters that air using low-force velocity to trap unwanted particles. Are the rotary blade’s days numbered? There aren’t many sticky-outy bits on the average smartphone these days, but can you imagine what it would look like with a rotary dial on the front? That was the norm for landline telephones until 1963, when industrial psychologist John E Karlin brought the idea for a telephone keypad to his bosses at Bell Laboratories. A simple idea, maybe. But remarkably, the order of the numbers on the keypad was trialed in 16 different combinations before Karlin decided he’d found the one that would win over loyal rotary-diallers. There wasn’t much call for Bluetooth earbuds in the early 1900s. Recorded music was still a long way off from being portable. But you could access an early form of podcast over your telephone – and you would listen through a stethoscope-style headset. This was the Electrophone system. 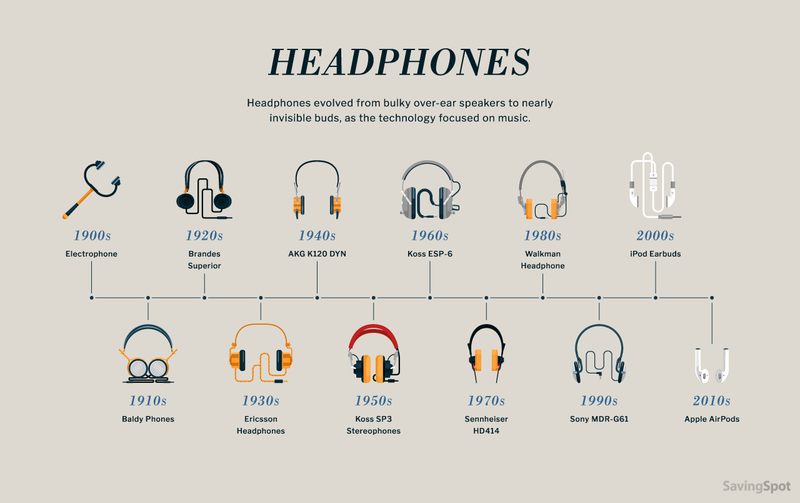 It was only in the 50s and 60s that headphones started to be truly desirable items. The Koss SP3 was the first stereo headphone in 1958, giving those space-age bachelors and bachelorettes the feeling that they were right there where the music was recorded. Sneakers actually originated in the 19th century, with the invention of plimsolls so quiet you could ‘sneak around’ in them. 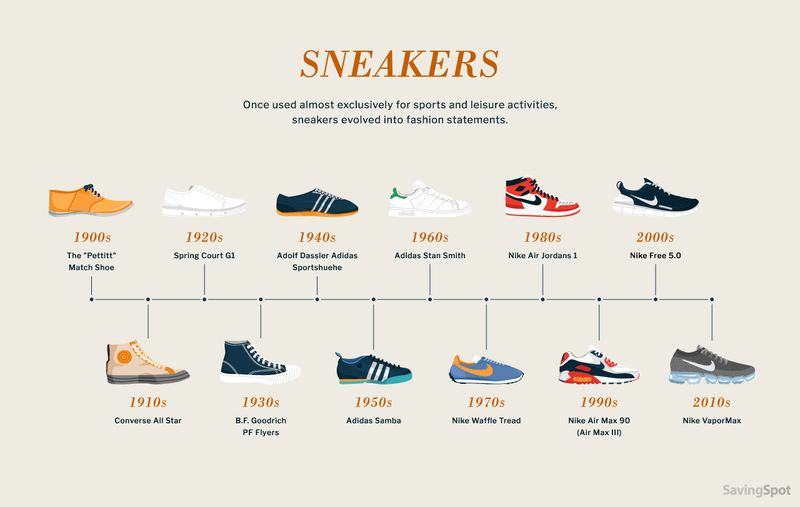 It wasn’t until the 1940s that they started to become a fashion thing, and sneakers for women didn’t arrive until the jogging craze of the mid-1970s! But as every Generation X kid knows, sneakers really came of age in the 1990s as designers capitalized on the increasing mainstream appeal of hip-hop and street fashion. 1990 saw the first Nikes to boast an exposed air cushion. This was the Eiffel Tower, the Anglepoise lamp, the Brompton bicycle moment for sneakers: the moment when form and function convened in a revolutionary design that would change the way we look at objects. Everything around you has evolved into the into the object you’re familiar with. In the next decade, the design of everyday objects will continue to evolve until they look as foreign to you as objects from the last century. 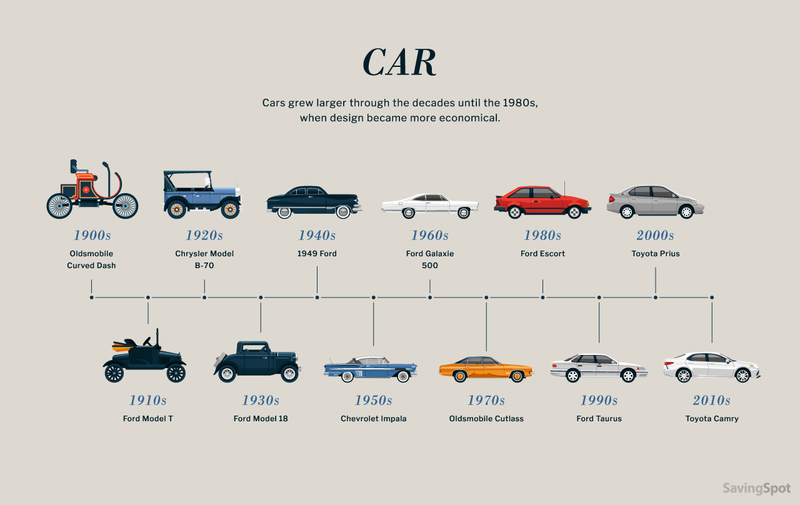 We wanted to create a new and updated version of Raymond Loewy’s 1934 chart, by showcasing the evolution of everyday objects from the 1900s to today. Each object we chose needed to be something that existed in 1900, that most houses would own, and which Americans still use every day to this date. We wanted to pick categories that demonstrated an inspiring story of evolution over the past 12 decades. For these reasons, we tried to choose examples that changed the path of each particular object. Bestsellers and fashion favorites were important, but the main thing was that each item should introduce a feature or style element that showed a step forward in the look of the object it represented. And then it was all down to our own designers to do these objects justice with their illustrations! Visit bit.ly/EvolutionOfObjects if you’d like to go through the research that went into creating this project.